Prepare to be absolutely gut-wrenched. 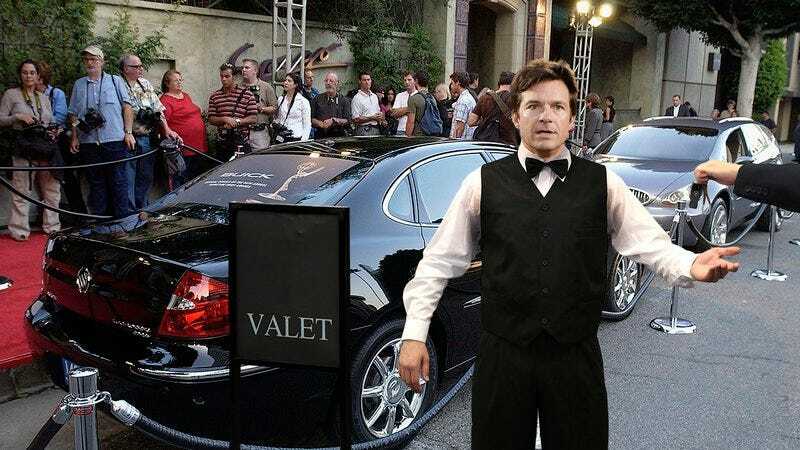 As the 69th Annual Emmy Awards commenced this evening, television’s biggest stars were met by Ozark actor Jason Bateman at the valet station. Everyone from Kevin Spacey to Anthony Anderson laughed immediately upon seeing Bateman in his valet uniform, as it became apparent that they all incorrectly think this is part of a bit to be revealed by Emmys host Stephen Colbert during the show. Oof. The fact that celebs are brainstorming fun Emmys sketches for Bateman, when in reality he’s scheduled from 5 p.m. to 1:30 a.m., is truly heartbreaking. A number of celebrity customers took selfies with Bateman after tossing him their keys, even as he repeatedly told them that his manager would kill him if he kept wasting company time with these pictures, but that only got him more laughs. Donald Glover was overheard asking how he should hashtag his Instagram with Bateman so it would appear on screen in case Colbert decided to scroll through a few pictures during his intro, a thing that will not happen because the only reason Bateman is even valeting at the Emmys tonight is because he picked up a shift from Rico. Making a sad scene even sadder, just moments ago, two dozen Emmys attendees crowded around at one point to watch Bateman argue loudly with the owner of a nearby Greek restaurant who claimed he had parked a Mercedes belonging to Jeffrey Tambor illegally in front of his store. Reportedly, Bateman has become visibly frustrated because almost no one is tipping, assuming the whole thing is an elaborate setup that is going to really kill onstage later in the evening. Damn. Let’s hope things pick up for Jason, because right now, we can’t think of a sadder thing.